Who’d have thought that a musical based on a film by controversial filmmaker John Waters could become both a Broadway and Hollywood hit? What’s more, it’s a musical about issues; body image and racism in particular. Tracy Turnblad (Nikki Blonsky) is a chubby teenager in Baltimore in the 1960s. She loves rock’n’roll, loves to dance and is desperate to get on local television dance show the Corny Collins show. Her attempts are initially thwarted by star of the show Amber Von Tussle (Brittany Snow) and her evil mother, Velma Von Tussle (Michelle Pfeiffer) but eventually she wins through and wins the affection of her crush, Link (Zac Effron). Once on, though, she discovers that she cannot handle the whiter-than-white station, and after meeting local African American dancer Seaweed (Elijah Kelley) and Motormouth Maybelle (Queen Latifah), she must stand up for what’s right. The music is great. Just writing about the film brings back so many of the songs (Welcome to the 60s, You Can’t Stop the Beat, I Can Hear the Bells, Good Morning Baltimore to name but a few). There is still a hint of John Waters dark humour in there, but it is an upbeat, fun film. Bright colours, superb cast, (not least John Travolta playing the extremely large Edna Turnblad and Christopher Walken playing the naïve and loving Wilbur). 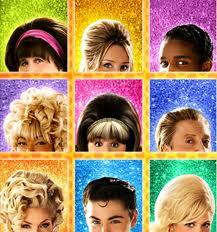 Sure, it’s a musical, but its one of those musicals that I just love.